As demonstrations on the border of the Gaza Strip continue, Al-Azhar condemns actions by Israeli forces and affirms solidarity with the Palestinian people. Al-Azhar condemned on Saturday the "brutal repression" committed by Israeli occupation forces against peaceful demonstrators in the Gaza Strip, a statement by the Islamic institution read. According to Reuters, Israeli soldiers shot dead three Palestinians, including a 14-year-old boy, who were among thousands of people who gathered at the Gaza Strip's fortified border on Friday as part of weekly protests launched six months ago. 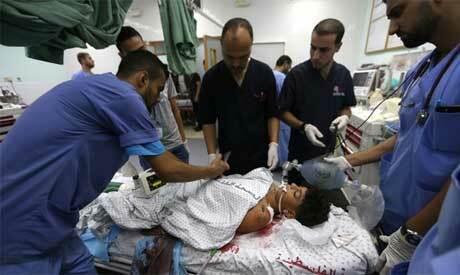 Reuters stated that Gaza health officials said 190 people had been wounded. "The occurrence of the massacre hours after the conclusion of the General Assembly of the United Nations meetings in New York demonstrates again the disrespect of the Zionist entity to the international community in light of the inability to provide protection for the Palestinian people and hold the occupation authorities accountable for the ongoing crimes," Al-Azhar's statement read. Al-Azhar reiterated its solidarity and full support for the Palestinian people in their struggle to defend their land and holy sites. At least 187 Palestinians have been killed since the Gaza protests began on March 30 to reclaim rights to land lost to Israel, and to demand an easing of the Israeli economic blockade over the Gaza strip in place since 2007.